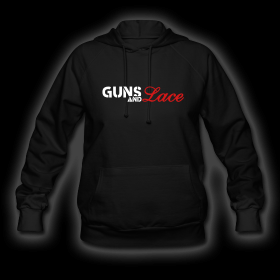 This lightweight hooded Guns and Lace sweatshirt for women is perfect for any season! The plush pullover has the LOGO on the front and a classic kangaroo front pocket. The Garment is pre-shrunk and laundered. The fabric is made from 50% cotton and 50% polyester and has a fabric weight of 8.0 oz. and it is recommended to order a size down.